How Sweet the Sound is a nationwide search for the best gospel choir in America. The goal of the program, which is in its 6th year, is to celebrate music and create a lasting impact on churches and communities across the country.. They will be in Detroit this Saturday September 15, 7:30 p.m. at the Joe Louis Arena. 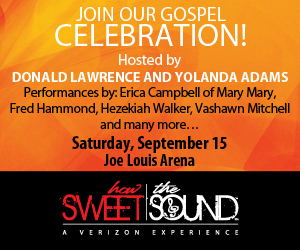 The event is hosted by Grammy-winning recording artists Yolanda Adams and Donald Lawrence and will also feature Erica Campbell of Mary Mary, Fred Hammond, Bishop Hezekiah Walker and Vashawn Mitchell. We have a couple of dozen tickets to give away. Send us your mailing address and tell us how many you need for your immediate family.